> Do you struggle with exam questions you’ve never seen? > Do you want to get better results by working smarter rather than harder? > Are you frustrated with study skills advice that just doesn’t seem to work for you? Here is a secret. Most top students are not necessarily gifted with superior intellect or extraordinary talent, but rather they are normal people who apply specific skills and systems to their learning. Skills and systems that can be acquired and honed to maximize performance! 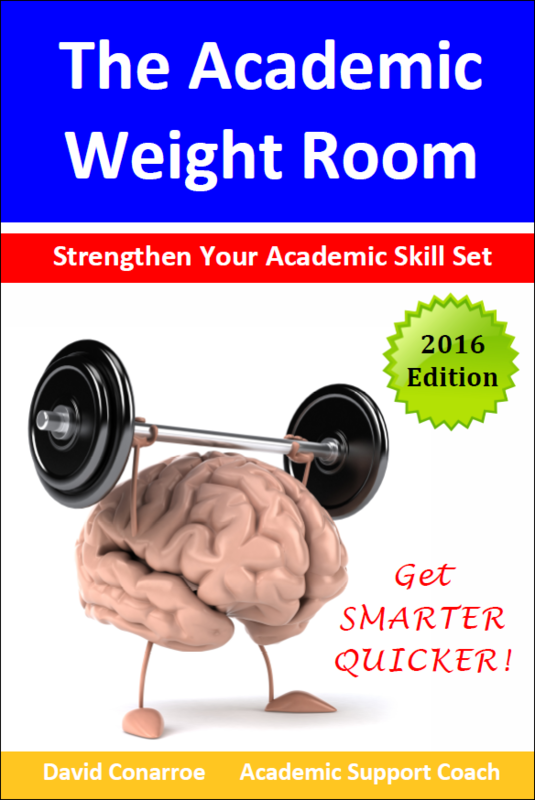 The Academic Weight Room is a new book for college-level students, as well as older and returning students, which offers a clear set of strategies and routines for overcoming classroom challenges. Written by one of the nation’s top academic support coaches, and supported by the latest research, the book is filled with clear, practical advice for improving a student’s academic skills infrastructure. This methodology has been used successfully with students and student athletes for more than 20 years and is a methodology that will pay dividends quickly. In the book, you will learn to develop the mindset that will get you results, and how to embed information using a proven flashcard methodology. You will also learn to decipher the command words that professors like to use, discover an essay structure that radically improves your efficiency, and understand how to get time back on your side. Plus much more! > Clearly understand how best to remember the content you have learned. > Know how to save time and energy through the use of a set of routines which clarify what to do before, during, and after class. > Discover an effective and efficient structure for crafting an essay or research paper which will significantly reduce your anxiety. > Understand how to break down an exam question you have never seen before, enabling you to handle just about any question the professor poses. > Find out what it takes to become the best student you can be, plus how to achieve this. Although written for a student audience, The Academic Weight Room is also of enormous benefit to parents, teachers and other educators who want to improve educational environments and processes for their independent learners. David Conarroe has been an educator and coach since 1976. His 35-year career in the secondary classroom as a teacher of business, IB Business and Management, IB Economics, AP Economics, and A-Level Business Studies in Northern Ireland included 10 years as high school athletic director and 25 years as head basketball coach. In 2012, he was hired on an interim basis by California State University, Bakersfield to stabilize and reinvent the athletics academic support center. Having accomplished that mission, he retired from CSUB in 2014. He is currently an academic support coach and consultant in support of The Academic Weight Room project.